This is a quick DIY project that I did to re-use some old CD's that I found. Naturally I do not use my CD's anymore but have a lot left over from the days of making mixed CD's. I had fun with this one because I found a few mixed CD's that had some excellent 90's tracks that brought back some pretty funny memories. It also displayed how my music taste has changed (for the better in some cases) over the years. It's a fun flashback project for sure. 1. 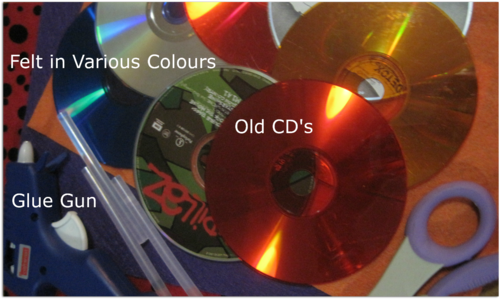 Decide what colour felt you want to go with which CD. I happened to have a number of colourful CD's so it made this step a little more fun but really it doesn't matter what combination you choose. 2. Cut the felt into roughly a 2 X 2 inch square. 3. Using your hot glue gun, put a blob (that is a technical term) of glue on each corner of the felt and place the square of felt on the side of the CD you do not want showing. Flip the CD over when the glue has hardened and there you have it folks, a new set of coasters! This was my lead up project to this awesome Up-Cycled Cassette Lamp! One of these days I will tackle this project but for now, I have a bunch of new coasters!